A 96-year-old Lancashire community and entertainment venue is on course for full refurbishment after the completion of the first stage in its renovation. Originally built in 1921, Lowther Pavilion is set in Lowther Gardens in Lytham St Annes and is a venue for theatrical productions, concerts, exhibitions, wedding receptions and community events. The first of a three-phase plan in the £5.25 million renovation project began in 2016 and was completed in 2017 with the completion of the new roof. Euroclad’s products provided enhanced thermal performance and recreated the shape of the building’s original roof, which had remained intact since its construction in 1921. 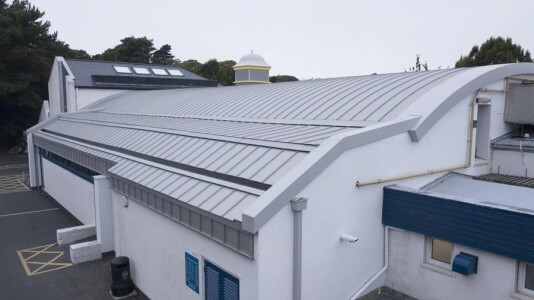 Improving the thermal performance of the roof was essential to this project so the existing roof was over-clad with a Refresh System featuring the Vieo warm roof; achieving the desired 0.11W/m2K U-Value, a highly thermally-efficient solution. Refresh Systems offer a package of over-clad roof and wall refurbishment systems that can be adapted to suit various existing construction types and achieve a variety of defined performances. The roof featured the Vieo roof profile in organic patina coated aluminium, which provided a weathered aluminium finish. The adaptability of the Vieo profile also allowed the specialist installers to remove a dip that existed in the original roof and achieve the look of a traditional pitched roof. As well as the new roof the first phase also included the relaying of the building’s original maple floor, construction of concrete supporting walls and the installation of new tiered seating in the auditorium. Funded by grants from Fylde Council, private donations and the Love Lowther renovation appeal – which is still actively raising funds – the refurbishment of Lowther Pavilion is set to be completed in time for the venue’s centenary in 2021. The project, which is being led by Andy Wolfe of architects Creative SPARC, has also been guided by feedback from public consultation events. Euroclad’s diverse range of steel and aluminium cladding systems are available in a choice of options and colours. Founded in 1981, Euroclad has maintained its cutting edge approach to high performance, cost-effective solutions to remain at the forefront of the industry for over 35 years.